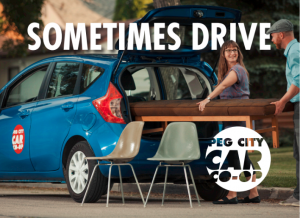 Peg City and Old Grace offer members low-cost, high-quality carshare – Old Grace Housing Co-operative Ltd.
Peg City Car Co-op and Old Grace Housing Co-operative have teamed up to provide OGHC members with easy access to two Peg City cars and a $75-per-member Peg City driving credit. Peg City Car Co-op is an innovative and successful Winnipeg carshare service. There are two Peg City cars on the OGHC site. Cars can be booked online, and picked up and returned at any time of day. The benefits of carsharing are significant. According to the Canadian Automobile Association, the average cost of owning and operating a mid-sized Camry LE in 2012, depending on distance driven, was between $9,142.12 and $13,654.12. (This figure does not include monthly parking fees.) You can use the CAA’s cost-calculator to determine the average cost of running your car.